Genealogy is my passion, and I love discussing genealogy. My Dad was a genealogy buff for over forty years, but I didn't get the bug until several years ago. The truth is that I learn as much or more from those with whom I correspond as they learn from me. a. Start with what you know. Family traditions and oral histories contain more truth than not. b. To find an ancestor another generation back, look at everyone within reason, eliminating those where possible. Scientists call this inductive reasoning. Once you have a short list of possibilities, research each person in detail. Scientists call this deductive reasoning. You cannot prove someone is your relative by researching up your family tree. You can only prove a relationship by researching down the tree. And when you eliminate everyone on your list, start over. c. When you reach another "brick wall," research the families your family married into. Genealogists call these "allied families." There is a myth that Colonial and Revolutionary American immigrants traveled alone i.e. the Rugged Individualist. BS, they traveled in extended family groups. You will occasionally read about groups of hunters or explorers migrating over the mountains, but even the famous Long Hunters--Knox, Chew, Walden, Boone--traveled in groups of ten or twelve. And, usually their companions were cousins or in-laws. Col. James Knox and 40 Long Hunters camped between Caney Fork and Skin House Branch for two years, collecting 2,600 deer skins and numerous bear and beaver pelts. In 1771 Knox built a stockade and Camp Knox became Green County's first permanent settlement. "The Long Hunters," Greensburg Co KY GenWeb Page <http://www.greensburgky.com/long.htm> 6 August 2005. After Daniel Boone's first trip into Kentucky, he returned to North Carolina to pick up more cousins and a few sons for the next trip to Kentucky. d. Find, read, and transcribe original/primary documents. People make mistakes. A whole lot of my Campbell cousins were looking for an ancestor (John Campbell) in Georgia, Alabama, Florida, and Mississippi in the 1850 Census. Everyone knew his family was in Covington Co AL, but not John. Then, I went back and transcribed the original 1850 Covington Co AL Census. Lo and behold, there was John stuck in the middle of his 18 brothers and sisters. The original transcriber simply missed him. e. The best advice I ever received was, "Trust your own research." Just because a bunch of experts and even the Mormon Church list a particular genealogy, this doesn't mean they have the only answer. Many times there are multiple spouses: the wife might be listed by her first married name and not her maiden name. Fathers and sons and mothers and daughters with the same names cause generations to be confused. f. And lastly, maintain a healthy sense of skepticism and your sense of humor. When you have your stuff together and bravely put your information out to the public, the first person who writes will be someone who absolutely disputes your findings. Hopefully, they wont call you some of the names I've been called. The caveat at the bottom of every page on this website states, "This site is provided for reference only. Except where specifically cited, information contained is conjecture and should not be considered as fact." That's legalese for, "If you don't like what I wrote, tough. My guess is as good as yours." Forrest Gump told us that, "Life is like a box of chocolates." And, I will tell you, " Genealogy is like a tree." The graphic below is the watermark I use for my webpage. I created/copied/edited/corrupted this image years ago. I like it because it's not symmetric. Sometimes, you have a thick trunk but no branches, Sometimes, you have a skinny trunk and lots of branches. And sometimes, the branch you are on is sawed off from under your feet. Back when, I was at a loss documenting my Case family--Mom was a Weaver, her mom was a Wilkinson, and her mom was a Case. I started with family oral history which states that the Cases were "very Irish" and pretty mean. In the Southern dialect, mean translates to clannish, penny pinching, and stingy with affection. The issue was that I had disparate records through multiple generations, but no structure to hang the records on: who was the father of whom going up the family tree? What I had to do was to focus on the branches and not the trunk. I had lots of records which connected the Cases with the Smith family of the Nathan Smith Settlement. And, the Smiths are well researched. So, I did the genealogy for the Smith family all the way down from Old Nathan to the girl who married into the Cases. Voila! Now, I had structure. Then, I went up the Smith tree and transcribed all the records connecting to the Cases. Now, I knew in which generation the records connected the two families. And from there, I built the skeleton of the Case family genealogy. Were you to go to my Case family which is listed under the Wilkinson family umbrella, the records support the narratives, and there is an appearance of a well documented, well researched genealogy. And, now it is. That's because I did the research, and I connected the dots. But, I started with a bunch of disassociated records for a bunch of guys named Case who lived in the right county in Mississippi at the right time. The purpose for the previous discussion is to illustrate how I connect Family A with Family B. You have to start with what you have and find a connecting point. And from the new connecting point, you can connect other members of the new family, going up and down the family tree. Even if you don't have names, still divide the new family by generations. I use familiar names for unknown family members like Dad, Mom, Son & Daughter. It's perfectly acceptable to note that William Case married Daughter Smith. Utilizing the dates associated with the generations from Family A, you can transfer those dates to the generations of Family B. With some notable exceptions, the dates should fit and help you find the missing name for that generation. Then, hang every record in the corresponding generation. Just think of decorating the Christmas tree. 1. Brick wall. Just what it sounds like. There is the sense that if you can only connect this one person, that person will connect to everything else I am looking for. And, sometimes, that’s true. 2. Clannish. You are either one of us, or you’re not. Considering so many of our families are Irish, Scot, Scot-Irish and Welsh, this really applies to us. 3. Allied families. Folks who usually settle near each other and continuously interact: intermarrying, acting as witnesses, trading land. As we, the early immigrants, were wary of strangers (clannish), you would be comfortable interacting with your allied families. 4. A cousinage is a group of allied families who live near each other and migrate en group as an extended family through multiple generations. We start with Family A, B, & C. After the first migration, we lose Family B but pick up Family D before the next migration, and so on. 5. Aunt, Uncle, Cousin. You grew up together, went to school together, go to church together. Familiar morphs to familial. "So, how are you related to John down the road?" "Oh, we’re not blood relation. He’s just a cousin." And, aunt and uncle are terms of respect for the older generation. Union MG Wm. T. Sherman was a westerner and a son of pioneers. He was fine with being called “Uncle Billy” even when he was in uniform. The concept of a cousinage is important for tracking families who migrated long distances in multiple iterations over an extended period: 1700 in Virginia to 1739 in Georgia to 1818 in Mississippi. Even if you don’t have to search over such an extended period or distance, the research methods still apply. Cousins married cousins and gave and sold land to each other. And, it’s through those records—if they can be found—that we find our answers. Understanding DNA tests, genetic markers, and their application as a genealogy tool requires advanced degrees across several disciplines--Genetics, Calculus, Statistics, Social History, Immigration History. However, we all can understand the application if we reduce the study down to the basics so we can read along with what the experts write. Research Note: Geneticists not genealogists came up with these descriptions and names. 5. atDNA: all the genetic combinations passed down from all the other ancestors. 11. Haplogroup: a name given to a group of similar genetic sequences. A new letter marks a major mutation which branches one group off from another. I am Haplogroup R. My ancestors went from B to F to K to P to R.
12. Subclade: a minor mutation within the Haplogroup. We, the Proto-Celts from the Atlantic Fringe, are descendants of R1b; R1a are in Central Europe and on the Asian Steppes; R2 went to Pakistan and India. 13. MRCA: Most Recent Common Ancestor; statistically how far back you have to go to find a connection to another person who matches you through a DNA test. 14. TMRCA: Time to Most Recent Common Ancestor expressed in years or generations. 1. As the human genome ages, it changes. At one time every Homo Sapiens Sapiens (modern people) had the same genome. The original sequence has been designated Haplogroup A000 (no subclades). They lived in Africa and never left. And reportedly, are non-extant. 3. Evidence for the mutation/ change is found by counting the “knots” on the DNA sequence at specific locations (loci/ markers). 4. How is this done? Per the FTDNA webpage, scientist #1 does a count. Then scientist #2 does a different count. And, scientist #3 does a comparison. If they don’t match, they start over. 5. DNA tests which have a mutation at a specific SNP are grouped into a Haplogroup. To be R1b, you must have a mutation at SNP M343. 6. As part of your test results, there will be an estimated Haplogroup which is based on the initial STR markers found. My Haplogroup [was] estimated to be R1b1a2 (old nomenclature). And, that SNP was posted in red to indicate an estimate. Through the appearance of individual markers on the human genome, our ancestor's path out of Africa, into central Asia, and back across to Western Europe has been proven. Research Note: The nomenclature of genetic genealogy is continually changing. Previously, subclades were identified with (phylogenetic) letters and numbers as in R1b1a2. However with the continuing identification of additional markers down the genome, it is apparent that use of individual marker names is preferred as in M343. Nomenclature for subclades are updated as of 2015. "Y-DNA Haplogroup R and its Subclades - 2015" <http://www.isogg.org/tree/ISOGG_HapgrpR.html> 10 June 2015. The Milesian(s) Invasion of Ireland c. 1,000 BCE. Having populated Ireland, their descendants, the Scoti, went on to populate Scotland and Wales. ***A refugium is a protected place of refuge, perhaps a sheltered valley, where early man survived the hardships of the last Ice Age. A well researched refugium was in the Loire Valley of France going south to the Pyrenees and northern Spain as evidenced by the cave paintings at Lascaux, France. This information is in part from the National Geographic Genographic Project where I am a contributor. The marker numbers in the preceding chart are the distinctive markers characteristic of the emergence of a new haplogroup which proves the mutation. The markers in bold are unique to the Genographic Project and do not correlate to ISOGG. Proto German. Speaks early German. What does the evolution of DF27 tell us? We, the families who descend from the Lewis family of Virginia, carry the genes of the Celtic Invaders of Ireland [DF27] c. 1.000 BCE. Our Celtic cousins [L21] were some of the original settlers c. 2,100 BCE. And, their DNA is the dominant strain in Ireland, Scotland, Wales and Cornwall; not ours. We are the interlopers who draped Britain with an overlay of Celtic language, art and culture before the Roman Invasion. Having obtained your DNA test results, the question is whether or not there will be a match and what to do with the information when there is a match. Using the 37 marker DNA test as the standard, the markers in the first group (01-12) mutate at the slowest rate (.002), the middle group (13-25) mutates at a faster rate (.003), the final group (26-37) mutate at the fastest rate (.004 - .005). Note, these are approximate averages across the entire group and not a specific rate per marker. These mutation rates are based on actual family studies where the living donor did not match the proven ancestor. Imagine someone asking you to do a DNA test and then getting permission to dig up your famous ancestor to test the corpse. And, there are three famous studies where that’s exactly what they did. For a more precise one-step mutation, go to the MRCA Calculator. Input the number of markers. Input the mutation rate based on the group where the mutation is found. Calculate for "Generations to MRCA." Your best answer is the first generation which is equal to or exceeds 50%. The answer indicates the number of generations up the family tree to the ancestor you share with your DNA match. 3. FTDNA: The TIP Calculator compares results between you and one other person and estimates the distance [TMRCA] to the common ancestor in generations. I find the TIP Calculator underestimates distance, and you need to "refine" your results by setting the matching generation to at least 5. And, the utility provides an excellent example of a data set. Lee DNA Genweb <http://leedna.com/dnaresults.php?rates=1> 12/2014. I have yet to find a reliable calculator that lets you input a mutation rate and calculates the correct TMRCA. Perhaps I will bone up on my Math and create one myself. Genetic Genealogy is a wonderful tool which can prove or disprove a relationship. But, it will never replace old-fashioned paper genealogy. And, the yDNA database can connect you to living family members you have never heard of. Surprise! My yDNA test connects me to a surname I've never known before. And yes, this happens about 10% of the time. Back when, I was notified that the Young family matches me 36/37. OK, I had to sit back and think about the many possible reasons why. Let's just say that there are a good 10 to 15 different reasons why. But in the absence of any other records, I prefer to focus on old reason #1. In the last decade, great strides have been made identifying new SNPs down the human genome and locating population clusters where these SNPs are present in a significant part of the population. Also, anthropologists have been able to match these mutations to specific places on the timeline of human history. With this information, we can affix our forefathers to specific times and places in the migration of modern man. At the end of the last Ice Age, modern man migrated up the river valleys into central Europe, settling both east and west of the Rhine River in what is now southern Germany and France. From this central location, their descendants migrated out to the far reaches of Europe. DF27, our forefathers, first settled in what is now northwest Spain c. 2,250 BCE where they developed new technologies and established themselves as a trading nation on the Atlantic coast. And in about 1,000 BCE, our forefathers emigrated first to Ireland and later to Scotland and Wales. Why was our family in Wales? Was it pressure from the invading Romans or the subsequent pressure from the invading Saxons? And, did our people ex-migrate out of Wales into southern England to the vicinity of Bristol or Wiltshire, England, before coming to America? We do not know. The modern history of our family begins about the time when English colonists braved the Atlantic Ocean to found Jamestown and the Colony of Virginia. In about 1650 or 12 generations ago in Virginia, our Lewis family split when the family of James Lewis of Louisa Co VA and the family of James Lewis of Lincoln Co MO split onto two new branches. In about 1750 or 8 generations ago in Virginia, the family split again onto three new branches. First the family of Edmund of Person Co NC, then the family of John of Caroline Co VA, and then the families of Joseph Lewis of Caroline Co VA and William Young of Page Co VA split onto individual branches. 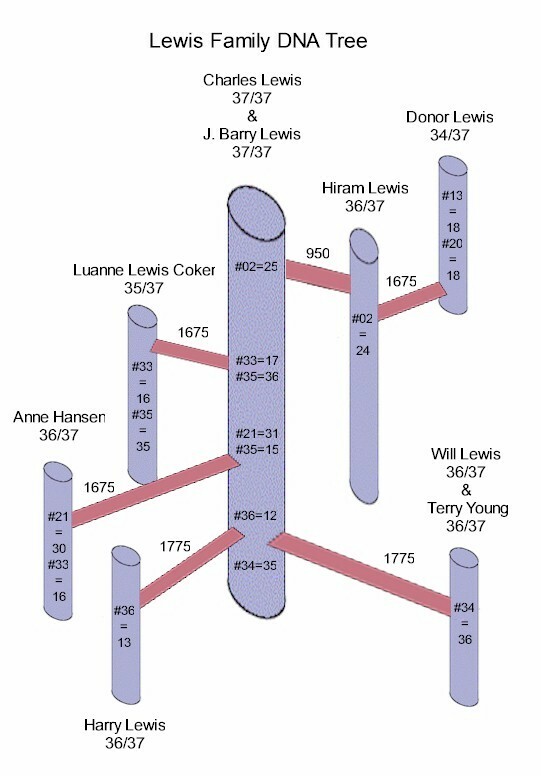 Note, Joseph Lewis and William Young are the same branch of the family. The question is, "What's their story?" This leaves the Walden Lewis family of Mississippi and the John Lewis family of Franklin Co KY and now the Rueben Kennedy family of Culpeper Co VA continuing on the original line. Continuing research indicates that the Rueben Kennedy family is also associated with the previously mentioned Joseph Lewis and William Young branch. Again, the question is, "What's their story?" And, the Walden Lewis family has circumstantial evidence which links them to the Lewises of Spotsylvania Co VA.
And having followed every step, we return to Step #1. Do the old-fashioned paper genealogy.